Today, welding remains as one of the most economical ways to join two metals together. Welding serves as an integral manufacturing function for automotive, aerospace, oil and gas, machinery, marine, solar and wind, and construction parts. Because the welded connection encounters load and stress over time, if the weld is poorly executed, it will not meet application demands and will ultimately fail. Failure of welded parts can lead to lawsuits and the loss of customers. Therefore, manufacturers must produce consistent high-quality welds to remain in business. But, what contributes to a good weld? a qualified, certified welder, and a method ensuring that the part remains securely in place. Why is securing the part important? Any movement of the part during the welding process makes it very difficult to consistently produce quality welds. To weld high-quality small parts, a good steel table with clamps that properly hold the part in place will often suffice. For larger parts, some manufacturers use handmade, temporary, static solutions or cranes and jigs. While these solutions have worked in the past, in today's age of automation and lean manufacturing, doing more with less using multi-axis welding positioners is the foundation of most improvement methodologies. With multi-axis weld positioners, a company can expand on the possibilities of welding automation by giving manufacturers the advantage of maximizing throughput and improving quality, while saving on floor space. The physics of Multi-Axis Welding Positioners are different from standard rotary tables. Instead of having the load capacities rely on the inertial loading and bearing capacities, a weld positioner is dependent on the static torque output limitations. A welding positioner system that is designed for efficiency will be balanced to move heavy weights at surprising speeds, consistently producing high-quality welded products. Multiple axis welding positioners are being implemented in many industries to reduce the footprint required to process and access parts, while minimizing the number of times a part must be manually moved. This is especially helpful for the manipulation of large parts during welding, such as aircraft wings or rail cars, which need to be welded and or painted on multiple sides. With multi-axis robot positioners flipping parts over can be achieved precisely without antiquated and costly cranes and jigs. LazerArc Multi-Axis Welding Positioners provide a superior accuracy, index time, and flexibility to meet the demands of modern automation systems. These complete 3, 4, or 5 Multi-Axis Welding Positioner machines are designed and engineered to provide superior performance in demanding industrial automation environments. 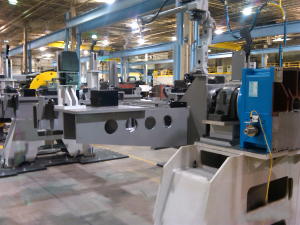 LazerArc positioning systems utilize one of two mechanical drive systems depending on customer requirements. Our high capacity "zero backlash" programmable cam systems create extremely high accuracies and repeatability of 2-3 arc seconds, while providing mechanical robustness to suit any size application. For material shuttling and transferring, LazerArc has engineered a multi-axis positioning system that utilizes a high-precision helical rack and pinion covering any distance while achieving extremely high accuracy and repeatability. LazerArc was established by Motion Index Drives in 2017 to separate the custom engineered solutions from standard product offerings for those customers looking for a wider selection of machinery to suit today's manufacturing automation needs. All of LazerArc's products are built and assembled with the highest precision materials and engineering expertise, and are customized to fit your specific applications.